Pink Pearl and Gemstone Earrings.Cherry Quartz 12mm, Facetted French Jet 8mm, Pink 8mm and 5mm pearls on sturdy hook, all sterling silver – 55mm. Coral tones in an accessory doesn’t necessarily need a coral bead especially when you are a person who refuses to wear coral as a gemstone. We know there are many people out there who love the colour of coral but draw the line at wearing anything made of sea coral. Cherry Quartz is the answer and is a lovely mood lifter when worn in any jewellery. 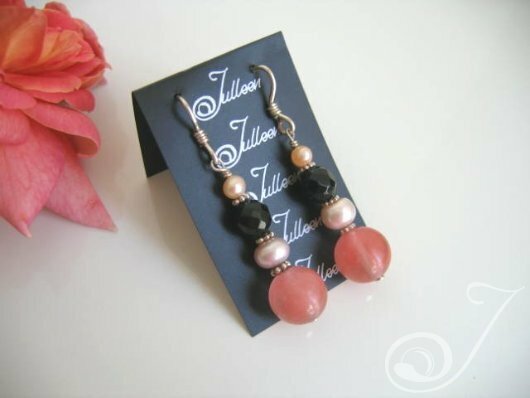 These earrings will give the wearer that pop of coral colour and instantly add warmth to any complexion. As refreshing as watermelon this is such a fun colour and gemstone to wear. A suggestion when looking for a particular coloured earring do a search using google images.